Hello traders, welcome to the Scalping Course and the third module, Scalping Setups. In this lesson, we’re going to go through level breakouts and momentum trades. And the reason we need to focus on this very simple kind of trading is because we are not going to be trading every single level breakout. We are going to be focusing only on the previous session’s high and the previous session’s low. And the reason we’re going to be focusing on the previous session high and the previous session low is because these two levels are the most important levels to take into consideration when trading momo on the next session or the actual session that you are trading right now. And you are going to see that just by pointing out the previous session’s high and the previous session’s low, you are going to get great entries on a trend continuation. And of course, we need to be focusing on a trending market. Because if you are analyzing price action on a very rangy market, you are going to get tons of false breakouts. So we need to focus on a market that has been trading for the past few sessions at least, because these levels are going to be tested over and over and we might get bounces or we might get breakouts. And what we’re looking for here are breakouts of these levels to trade the momentum in the direction of the trend. Now, we’re going to go through the Euro/US Dollar chart. And the Euro/US Dollar has been in a downswing or in a down move for the past couple of sessions, so we’re going to check it out. Okay, we’re back, and this is the Euro/US Dollar three-minute chart, so let’s go to the 50-minute chart to get a hold of what has been going on on the past sessions. So let’s go to the 50-minute chart right now. Okay, there you go. The first thing we want to do is look for the direction of the market. And as you can see here, we have the highest point on the last session right here, and we have the lowest point of the past session right here. So the first thing we’re going to do is we’re going to point out the previous session’s low, which is this point right here, okay? Well, we’re going to leave this color for the previous session low. And the reason we are going to be focusing only on the previous session low is because we are downtrending, and what we want to do is this level to be tested over and over until it breaks, okay? Now, this is the first thing we’re going to do. We’re going to look at the previous sessions to see what the direction of the market, and there, you can see right here that well, the previous session had a range of about 125 pips to the downside which means that we are in a very strong down move right now. Now, the second thing we’re going to do is we’re going to look for targets, okay? Because we want price to break to the downside, we need also targets to the downside. And I think that the first target or the first zone where we will find some buyers will be here at this previous area of resistance. And of course, we can also point out well, this previous base on this trading session, I’m sorry. So we are going to focus on this previous base because we want this red level to break. And I think that you can understand that where we found a huge bearish pressure in the past, we might find a huge bullish pressure right now that this level is going to be tested as support. And if broken, we want our final targets to be at this base, okay? Now, you can see that we were trading above these levels until the previous session low, which is the level that we are looking for for our break. Now, let’s go back to the three-minute chart, and I’m going to show you how to put your stop signs and where to look for the setup. Now, here we are, and the first thing we’re going to do is we are going to go to the daily high. Now, you can see that we do have a higher high than the previous session’s final high, which is this level right here. But it doesn’t matter because what we are looking for is a break to the downside. Now, you can see that we are making lower highs which will mean that we are following a corrective . . . well, it can be a corrective move to the upside. And one aggressive way to trade this breakup would be to go short right here at the break of well, this trend line, but what we are looking for is we are looking for a total break of the previous daily low which would mean that we are actually continuing with the previous session’s trend which is a down trend. Because if we break with this immediate trend line, price can go . . . and test the previous daily lows and just explode to the upside. So we are looking for a break of this area. Now, the first thing we’re going to do is we’re going to place a pending sell order just below this area right here, which will mean . . . just let me color this blue because this is our entry zone, and our stop-loss should go above the previous low. And let me explain to you why is that we are going to be looking at this setup like this. Let me just put this line on a horizontal mode, and I’m going to show you why. Okay, this is the previous base. Price broke with the previous base and broke with the daily lows, giving us a short entry and a feel on our pending short order. Now, if price breaks but then comes back, it can come back to retest the zone or it can come back to retest the previous lows. So we want our stop-loss to be above the previous low. Because if price breaks above the previous low, this short idea is invalid and we must get out immediately. So our start should go around this level right here. Let me just color it red because the stop-loss . . . or some kind of red, if I can find one. Orange red is fine, and I’m thickening it up for you. Now, this is our stop-loss level, and you can see that right here, we have a very tight stop of 12 pips, which is awesome, because that’s what we want when scalping. We want [inaudible 00:08:27] stops and we want momentum. And right here, we’ve got field. We have a 12-pip stop-loss, and we have our first target right here. You can see that the first target is actually very close to our entries, but remember that those are the levels that we are working with. Now, the first target is right here, and you take profit of 14 pips, which is very good, because what you did there is take better than a one-to-one risk to reward ratio on your first half of your position. You have to be very disciplined when it comes to scalping, and if that’s the level that the market was giving you, that’s the level you are going to take. So you get filled on the first half of your positions of our 14-pip win, and you are going to move your stops to break even plus one or two pips to account for the trade commission. Now, once you have the first half of your position filled in a profit, you’re going to move your stuff to breakeven and you’re going to let the rest run. 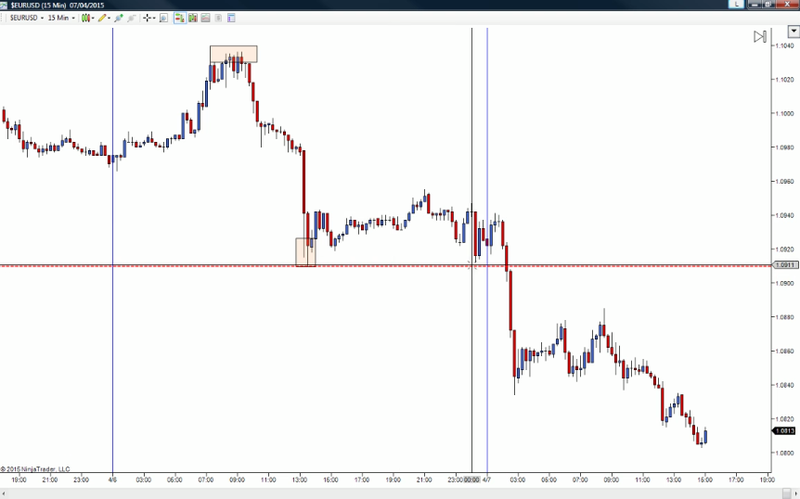 And, in this case, you can see that you have the second profit-taking target right here for about 43 pips. And remember that we are just rating momo at this point, so when you see these two candles, you can manually close your trade, because we are so close from our target that you should be able to notice where buyers are coming in. And here you have two very distinct rejection candles. That can mean that price is going to start to move up after this strong move to the downside. Now, you can take profit here or you can wait for your targets to be hit here, but this is not a fully-automated method of trading. Of course, there is some decision making progress that you need to go through, and I would have taken my trade right here after the second candle of indecision for a second position profit of 36 pips, making this a 50-pip winner and a total risk of only 12 pips. So this is what we’re going to be looking for. If you are in a down move, you’re going to be looking for the daily low. Then you’re going to look for targets. And of course, if, well, the first target that you find is not a one-to-one risk to reward ratio or better, you are not going to be taking that trade. You need better than a one-to-one risk to reward ratio on your first target. And then the second target doesn’t have so much importance into your decision of entering or not because we are way above a one-to-one risk to reward ratio. In this case, we were a one-to-four risk to reward ratio on our second target. So the rules are look for the market direction. If we are in a down trend, look for a daily low. If we are in an uptrend, look for the daily high. Then, look for levels to take profit on your trade. Calculate your stop-loss and then your first target. If it’s better than a one-to-one risk to reward ratio, you take the trade. If it’s not, you don’t take the trade. And if it is, you put on the pending order with your stop-loss levels and your targets for a nice level breakout.